The Space Shuttle Endeavour has docked with the International Space Station. The delicate docking maneuver took place while both spacecraft were circling the globe at about 17,500 mph (28,165 km/h). Endeavour lifted off from Kennedy Space Center early Monday.During the two-week mission, the six-member crew will deliver an Italian-built Tranquility node and a seven-windowed cupola to the station, which will be used as a control room for robotics. The mission also will include three spacewalks. 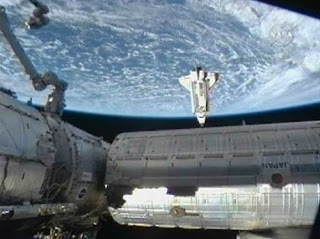 The space station will be about 90 percent complete once the node and cupola are added.